The author John Green on a YouTube post Why are American Health Care costs so high? makes the (referenced) claim that US public health expenditure per capita, is higher than most other developed countries - even where those countries then provide free healthcare. First I have to blow your mind. [...] That's right Hank: you pay more in taxes for healthcare than you would if you were British, and in exchange for those taxes, you get no healthcare. The situation may have changed of course since the video was published in 2013.
health care goods and services (i.e. current health expenditure) including personal health care (curative care, rehabilitative care, long-term care, ancillary services and medical goods) and collective services (prevention and public health services as well as health administration), but excluding spending on investments. In 2013, the year that the video was apparently published, the USA spent 4207 USD per capita on health. This was the sixth highest spending in a list of 44 countries. Luxembourg and Norway had much highest spendings (with 5594 USD and 5084 USD, respectively), while spending in Switzerland, the Netherlands, and Sweden are reported only somewhat higher governmental spendings than the USA (4360 USD, 4300 USD, and 4228 USD, respectively). The United Kingdom, the country apparently referred to by Green, runs at position 15, with 3057 USD per capita. The same pattern is visible for the years leading up to 2013: Each year, Luxembourg and Norway are two countries with exceptionally high public spendings per capita. The United States is among handful of countries that vying for the ranks immediately below these two exceptions. This pattern supports the claim made in the video that public spending in the USA on health resources was higher than in most developed countries at the time the video was produced. The pattern changes after 2013: Now, public spending on health expenditures in the USA clearly surpasses that of any other country, including Luxembourg and Norway. This increase in public spending in the USA that sets in in 2014 offsets a notable drop in voluntary spending. I suspect that this is the effect of the Affordable Care Act which came into force that year. The latest available figure for the USA is from 2016. In that year, the USA is listed as the country with highest spendings per capita with 8047 USD. The amount for Luxembourg, the country with the second highest spendings, was 5643 USD, with Norway, Switzerland, and Germany following (5257 USD, 4912 USD, and 4612 USD, respectively). To summarize, since 2007, the USA were always among the countries with the highest public spending on health resources, according to the figures released by the OECD. In the years leading up to 2014, the USA were clearly surpassed only by Luxembourg and Norway, and competed with a few other countries for rank three behind these two countries. Starting with 2014, public spending on health has sharply increased in the USA, making it the country with highest spending among all OECD countries. The chart uses the metric of spend as a proportion of GDP which avoids many issues with exchange rates and income comparability. But it is worth noting that US GDP per head is high compared to most of those comparator countries. The USA's total spend on healthcare is by far the highest. Government funded care is higher than the UK and Canada but slightly less than Germany, France and Japan. So, on this criterion, the USA is not the highest user of government money on healthcare. OECD data for multiple years show that this is similar to the situation over the last decade (though recent OECD stats have redefined some private spending on insurance schemes in the USA as government or compulsory spending which makes the USA by far the highest spender). But the context of these numbers needs to be understood for proper comparability. The government funded healthcare in the USA does not provide healthcare for the majority of the population. In the other countries the government spending achieves universal coverage. The UK's NHS achieves free healthcare for the entire population for a smaller proportion of GDP than the USA spend which only covers the retired and selected populations of the poor and veterans. Moreover, since US GDP per head is larger than the UK and most of the big comparators, the failure to achieve what other countries do is even more stark. 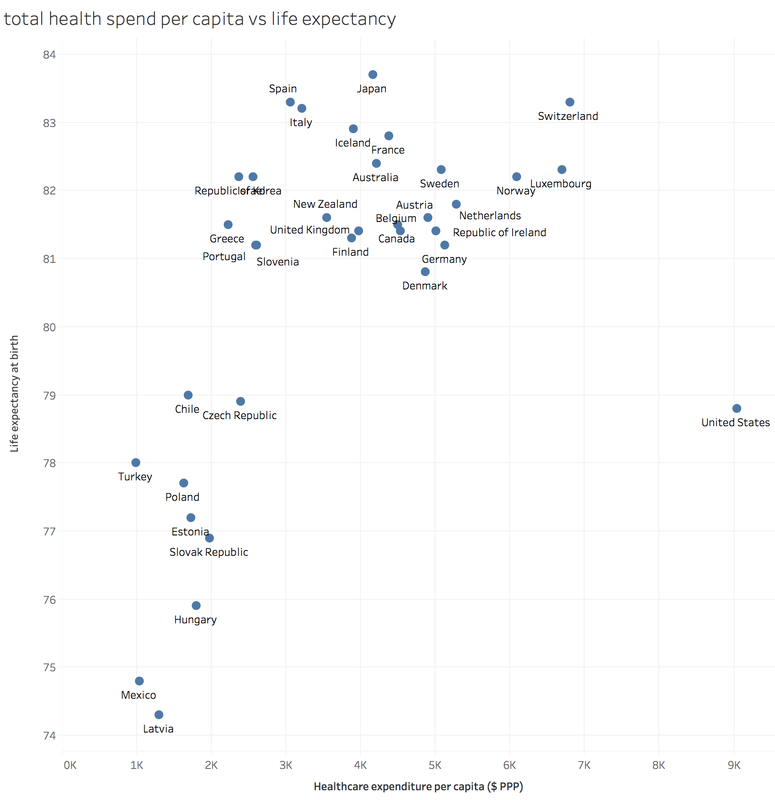 The USA is a major outlier on spend but gets life expectancy comparable to Chile and the Czech Republic and substantially worse than most comparable industrial economies. Summary The USA spends a similar proportion of its GDP on government funded healthcare to other major developed countries (not quite the highest but not far from the highest spenders). All those other countries achieve universal health coverage for that spend but the USA government spend (mostly Medicare and Medicaid) only achieves coverage for about one third of the population (see this analysis). Total spending on health is much higher than any other major economy and even government funded healthcare is among the highest (but not the highest) despite achieving poor coverage for the population. I believe Schmuddi's answer subtly changes the comparison here slightly. The raw dollar spend per capita is comparable only insofar as government expenditure per capita were the same. The fairer comparison is arguably the proportion of overall fiscal expenditure allocated to healthcare-related costs. Indeed, the claim in the question is that an American pays "more in taxes for healthcare than [he] would if [he] were British", which calls to account the relative proportions, as tax is typically associated as a percentage of one's income. The average American is significantly better paid (c. 30% more) than his British counterpart (OECD, via wiki), and so his tax contribution is naturally greater in nominal terms for a given personal taxation rate (not to mention the differences in tax rate; I assume equality here, though this is likely to favour the Briton as US taxes are on average lower). If we take equivalent incomes, and equivalent tax rates, then the American government will spend 27% of the citizen's tax contribution on healthcare. (National Priorities (2015)). Her Majesty's Government will spend about 19% of the tax contribution on healthcare (HMG Budget (2016) via Wiki). The conclusion, however is that both in nominal and percentage terms, the US government seems to spend more on healthcare than the UK. Adding to the complexity here from the other answers, particularly Zac's answer... Citizens are generally concerned with the percentage of their income being spent on health care, not the percentage of their taxes. For the median household income of the US at $43,000 if unmarried will pay 25% tax and 15% if married. The median household income of the UK at $31,000 will pay 20% tax widening the gap between what Americans and British pay. The unmarried American in this will pay 6.7% of income for healthcare. Falling to 4% if married. The Brit will pay 3.8%. Marriage makes little difference. So Americans pay the same in taxes if they are married but a lot more if single. Not the answer you're looking for? Browse other questions tagged united-states healthcare public-health .